The Hudson River has been one of America’s most important waterways since before the nation was founded. 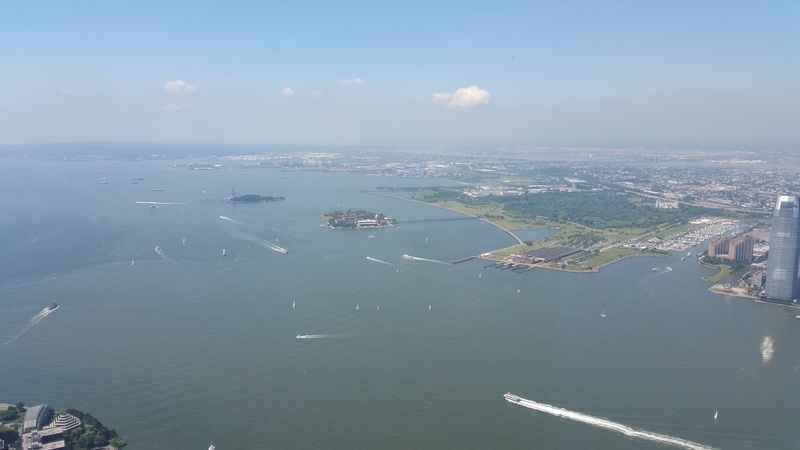 Stretching 274 nautical miles from its headwaters at Henderson Lake to the point where it empties into New York City’s Upper Bay, the Hudson provides passage from the Atlantic into the Great Lakes thanks to its connection to the Erie Canal. Although only about a tenth of the length of the Mississippi, the Hudson is easier to navigate, and deeper; near West Point depths of over 200 feet can be found. During the Revolutionary War, control of the Hudson was critical to the war effort of both sides. The British knew they could split the colonies in two if they controlled the river. 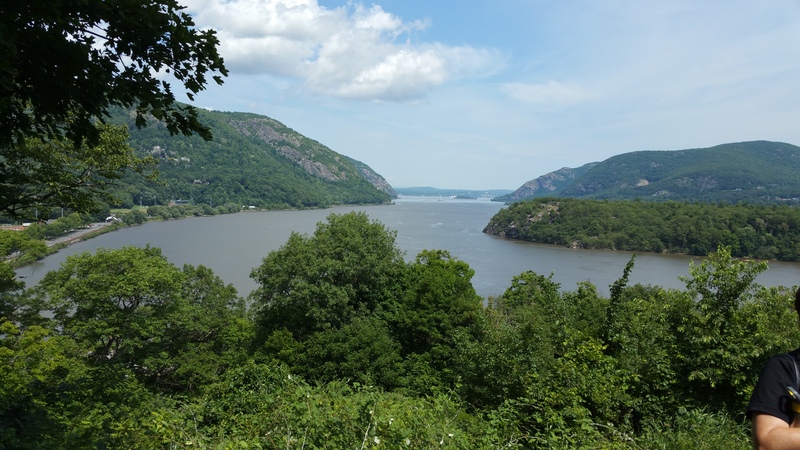 The rebels knew that, too, so early on they built a fort at the S-curve of the Hudson at West Point. Fort Clinton was built in the late 1770s by Polish military engineer Tadeusz Kosciuszko, and its garrison was never challenged by British troops or naval vessels. It almost fell to the enemy anyway, thanks to the treason of its commandant. 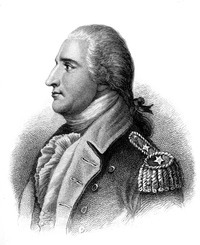 General Benedict Arnold had distinguished himself in battle for the American cause, but became disillusioned and decided to turn Fort Clinton over to the British in exchange for cash and a commission in the British Army. He began a secret correspondence with General Sir Henry Clinton, commander of all British forces in North America, and in 1780 Clinton assigned his intelligence chief, Major John Andre, to meet with Arnold near West Point. Andre sailed upriver aboard HMS Vulture and went ashore to meet with Arnold, but the ship was forced to head back to British-occupied New York City after taking heavy fire from American shore batteries. Forced to find his way back to friendly lines on foot and carrying documents written by Arnold, Andre was captured in Tarrytown. Andre was tried and hanged, but Arnold escaped West Point before George Washington and his men arrived. Arnold got his British commission and saw action on their side for the rest of the war. But the British didn’t like him very much, either, and after a spotty business career in Canada and the Caribbean, he died in England at age 60 in 1801. West Point’s reputation has long since recovered from the treachery of Benedict Arnold during the Revolution. 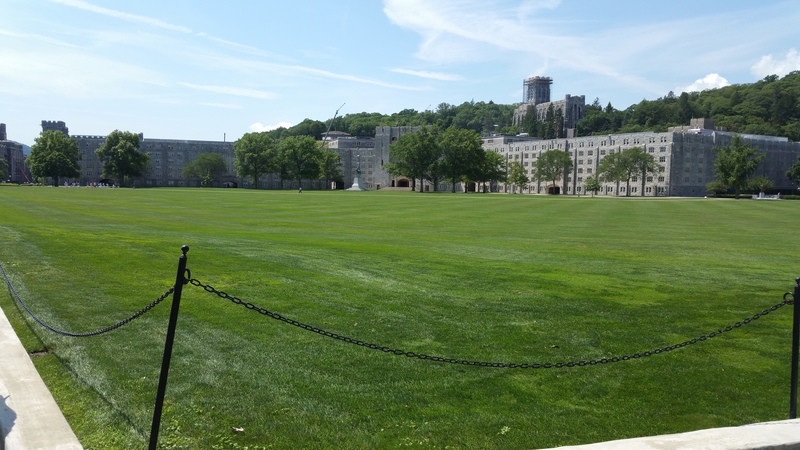 The U.S. Military Academy was founded at West Point by President Thomas Jefferson in 1802. 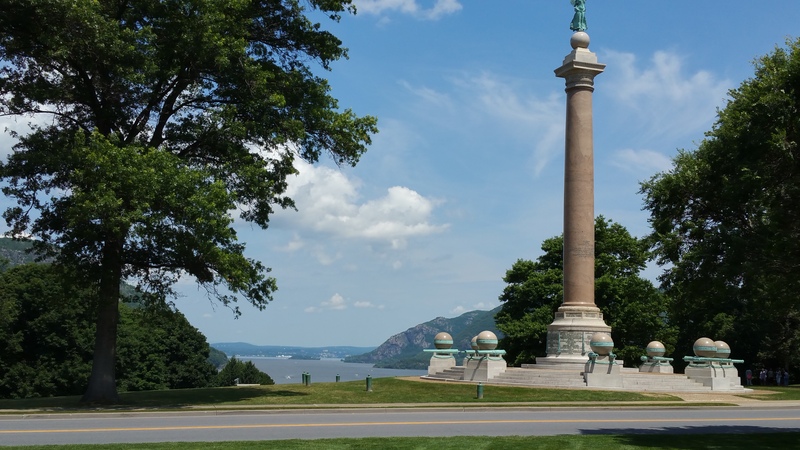 Over 213 years later, West Point remains the longest continuously-occupied military post in the nation. The academy didn’t really take off until it came under the command of Col. Sylvanus Thayer in 1817. 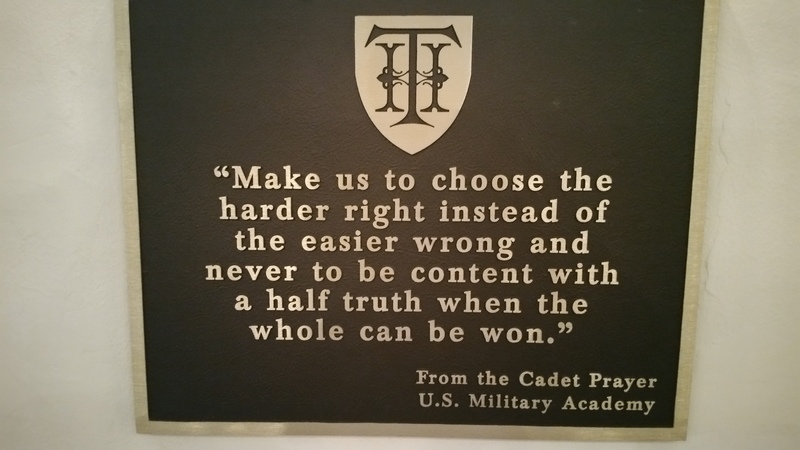 Thayer instilled strict discipline within the Corps of Cadets and revamped the curriculum, with an emphasis on engineering. USMA graduates were instrumental in the construction of much of America’s infrastructure during the first half of the 19th century. In the Mexican-American War (1846-48), Academy grads distinguished themselves in battle, among them future generals Ulysses Grant and Robert E. Lee. Today, the Academy has about 4,300 cadets, with some 15% being women. The four-year graduation rate is 80%. By comparison, UW-Platteville, from which Alan and I both graduated, has a rate of only 52%. Prospective students must have an appointment from a member of Congress or the president or vice president. In addition to having strong grades in high school, candidates are evaluated based on their extra-curricular activities and are subject to an assessment and a physical exam. It is not an easy place to get into, but if you do, you get a first-class education at no charge and a guaranteed job upon graduation; Academy grads are expected to serve in the Army for a minimum of five years. The academics are rigorous and there’s not a lot of screwing around outside the classroom. Cadets are required to pass the Army Physical Fitness Test twice a year and also must participate in intercollegiate or intramural athletics. 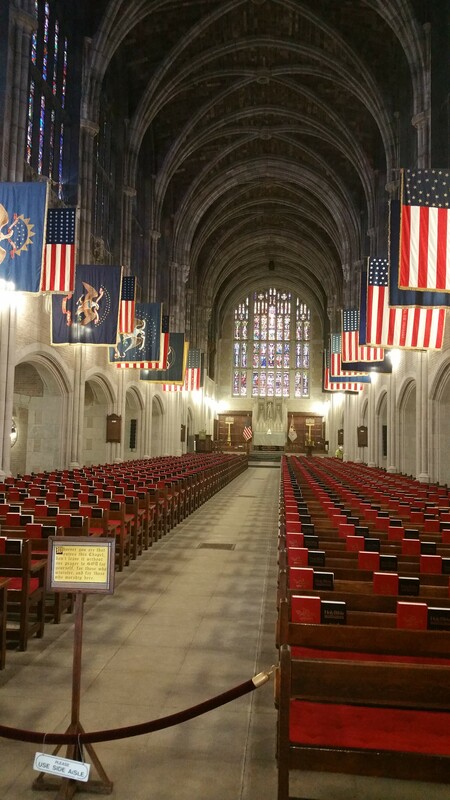 Theodore Roosevelt called West Point the most “absolutely American” institution in the country. In his book Absolutely American, author David Lipsky, a contributing writer for Rolling Stone, said the cadets impressed him as the happiest college students he’d ever seen. Since the Academy is an active military post, security is fairly tight. We went through a couple checkpoints on our way into West Point itself, which is next to the village of Highland Falls. Our lodging for the evening was at the Thayer Hotel, one of the pricier hotels we’d booked on the trip, but well worth the cost. 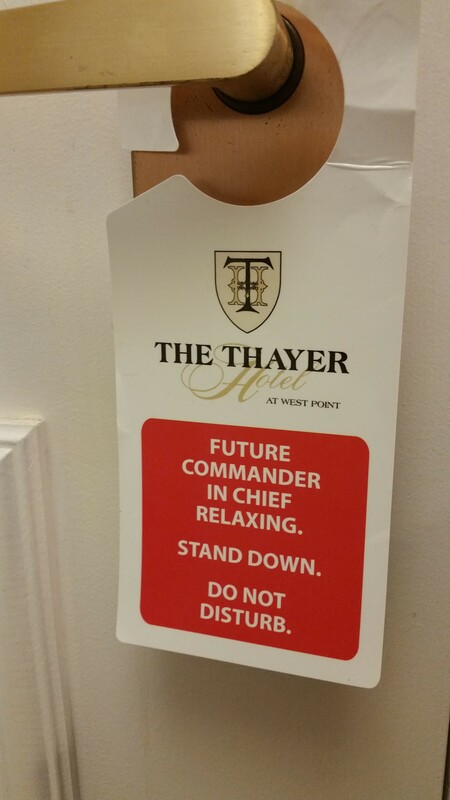 Check it out here: The Thayer Hotel. 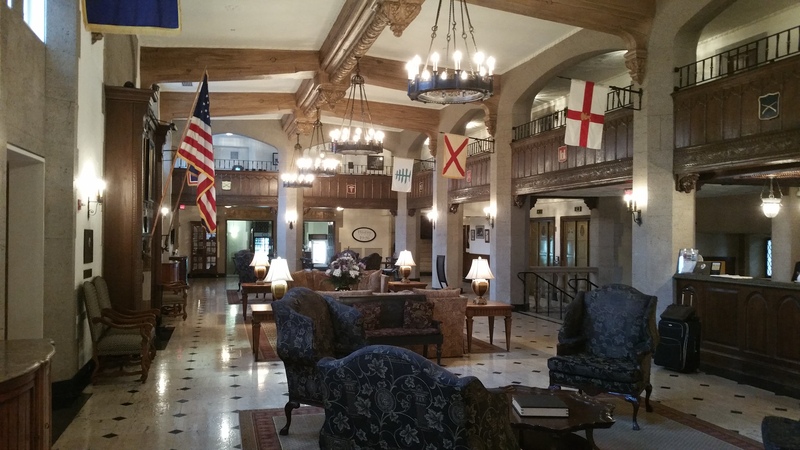 The lobby of the Thayer is exactly what you’d expect from a place steeped in history. …as well as other inspirational messages. Even the door tags fit the theme. The Thayer opened in 1926, replacing the venerable West Point Hotel, which opened in 1829 and was on the opposite end of the post, on Trophy Point. The original hotel greeted many a famous guest in its almost-100 years history. 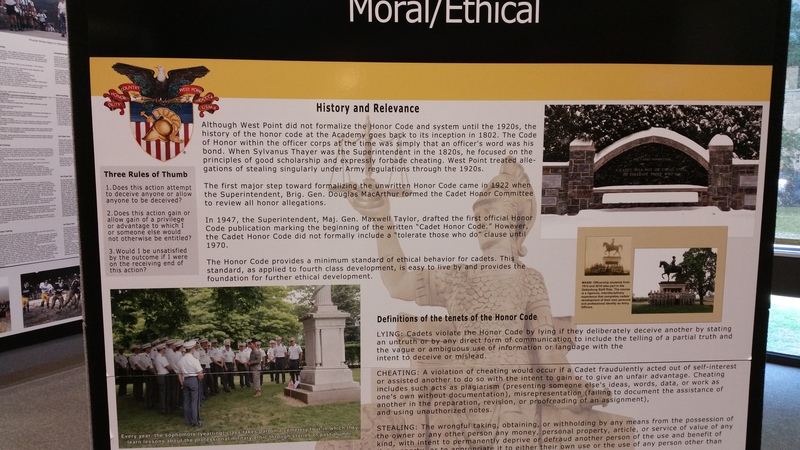 Parents of cadets often stayed there while visiting their sons, as the Thayer hosts many a parent today. Perhaps the most famous parent, certainly one of the longest-tenured, in the old hotel’s history was the mother of Douglas MacArthur, who stayed there during all of her son’s four years as a student. She had a room on an upper floor overlooking not the Hudson, but the famous Plain, with the barracks beyond it, so she could see her son’s room every night and make sure his light went off at the appropriate time. MacArthur was later superintendent of the Academy and oversaw an extensive remodeling and building program, including construction of the Thayer. His last visit there was 1963, for a quiet stroll through the cemetery. A year earlier he had addressed the cadets with his famous “Duty, Honor, Country” speech. We had contracted with the Academy’s official tour operator for a tour of the post. While waiting to board our bus we chatted with a number of Chinese students who were here on their own tour of the U.S. Then we were off, finally visiting the place neither one of us had had the gumption to apply for when we were kids, but during our visit both of us thought of how terrific it would’ve been to matriculate here. The ethical underpinnings of the Academy are often scorned by today’s culture, but they form the bedrock of one of the world’s great educational institutions. The mighty Hudson, looking south from Trophy Point. 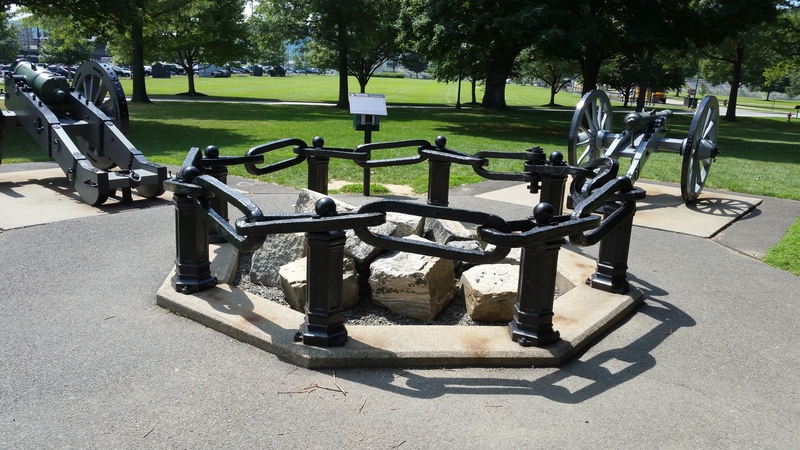 Part of the Great Chain, which colonial troops forged and stretched across the Hudson to deny the river to the British. The chain was 600 yards long and weighed 65 tons. 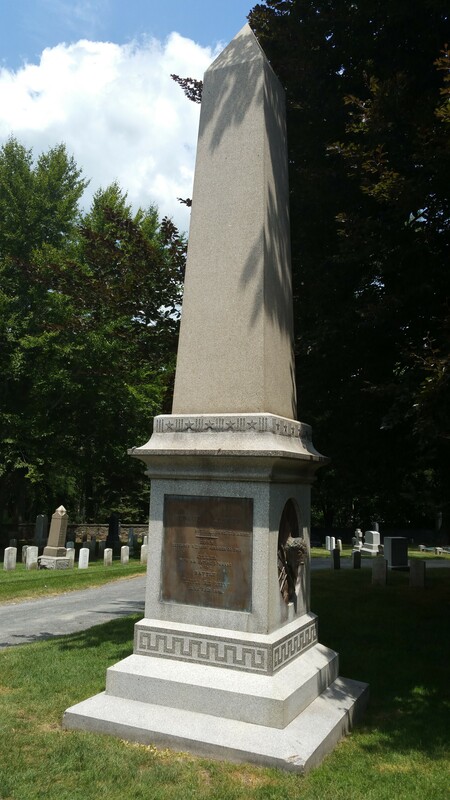 The Civil War monument at Trophy Point. The Plain, where generations of cadets have marched and trained. Also, the site of the first Army-Navy football game in 1890. 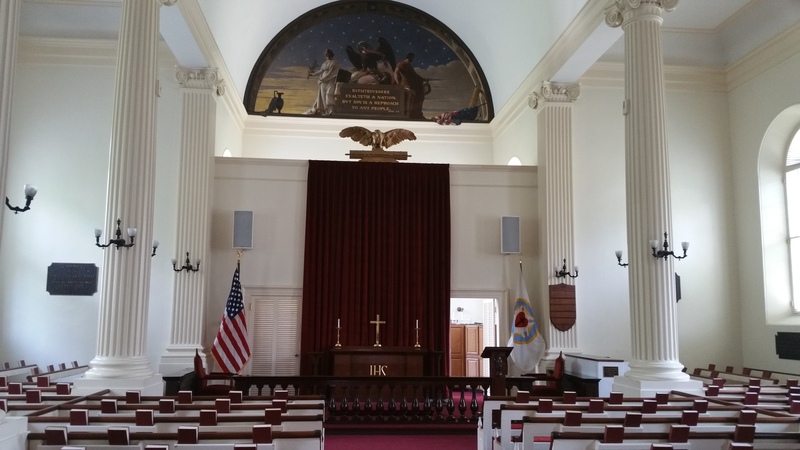 The Old Cadet Chapel, built in 1836, today hosts Lutheran services during the academic year. 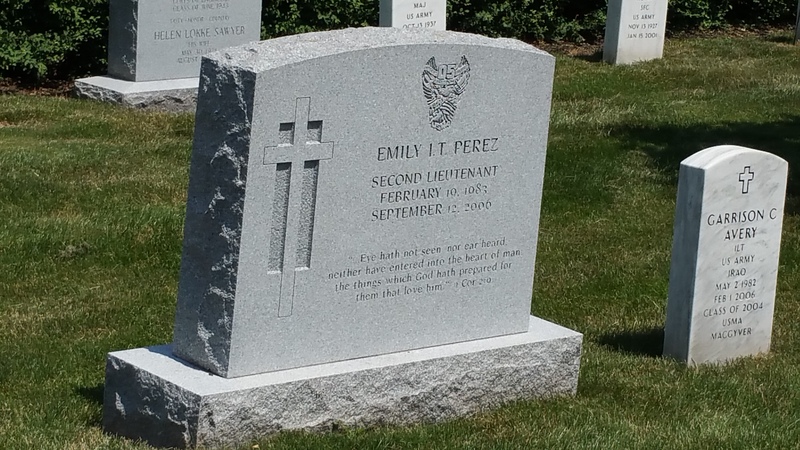 2nd Lt. Emily Perez, Class of 2005, who was killed in action in Iraq, 2006. While at USMA she was Command Sergeant Major and excelled in track and field. 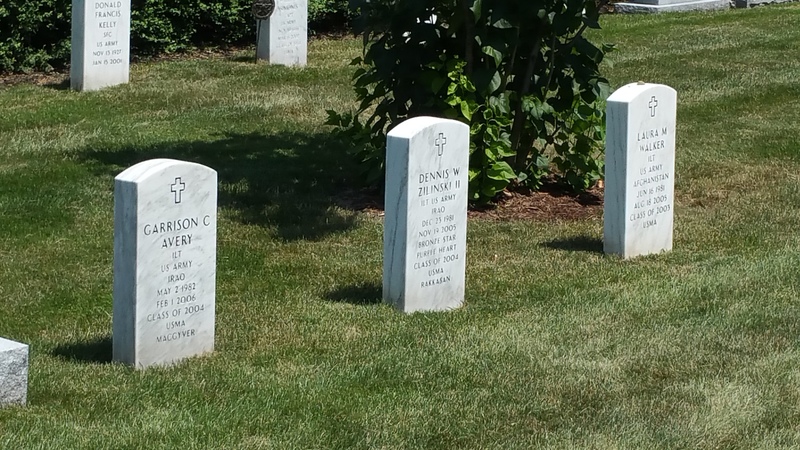 Three USMA graduates who made the ultimate sacrifice in the War on Terror. At right is 1st Lt. Laura Walker, Class of 2003. Led the USMA women’s handball team to a national championship. Killed by a Taliban bomb while helping her engineering unit build a road in Afghanistan. 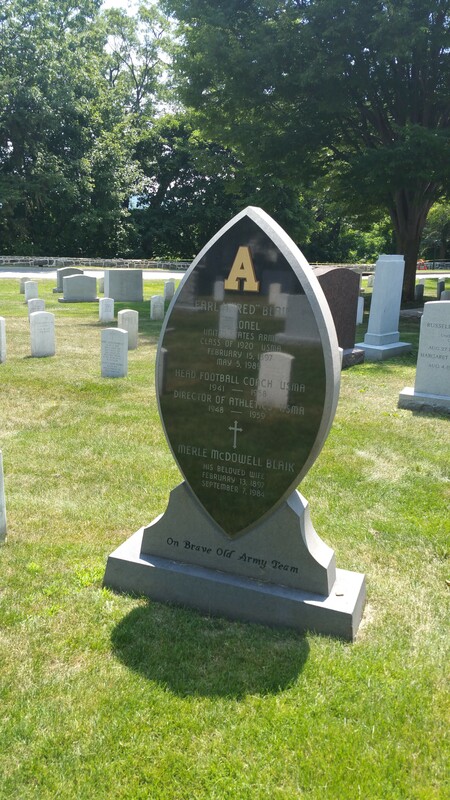 The first female USMA grad to be killed in action. Col. David “Mickey” Markus, who served in WW2 and after leaving the Army, went to Israel to lead its fledgling army in its war of independence. Killed by friendly fire in 1948. He was played by Kirk Douglas in the 1966 movie Cast a Giant Shadow. Earl “Red” Blaik, head football coach from 1941-58, winner of three straight national championships. Vince Lombardi was one of his assistant coaches. Lt. Col. Alonzo Cushing, Class of 1861. A native of Delafield, Wis., Cushing died while commanding his artillery battery at the Battle of Gettysburg. 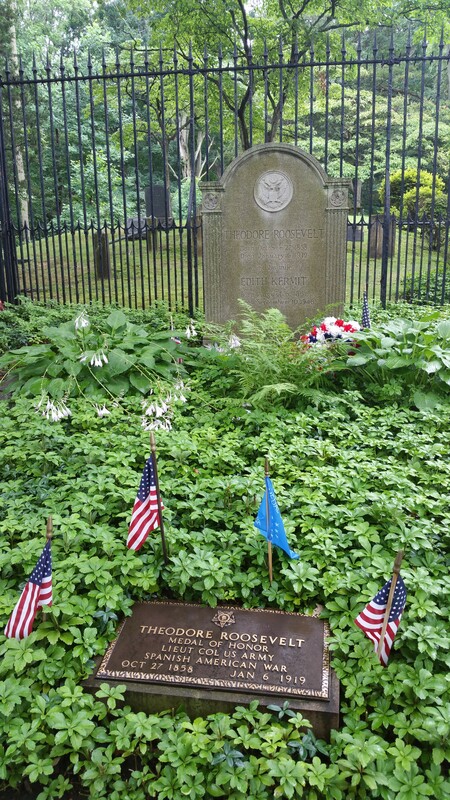 His heroic actions helped hold off Pickett’s Charge. Awarded the Medal of Honor posthumously in 2014. Maj. Gen. John Buford, Class of 1848. His cavalry troops secured the high ground at Gettysburg in the early hours of the battle. 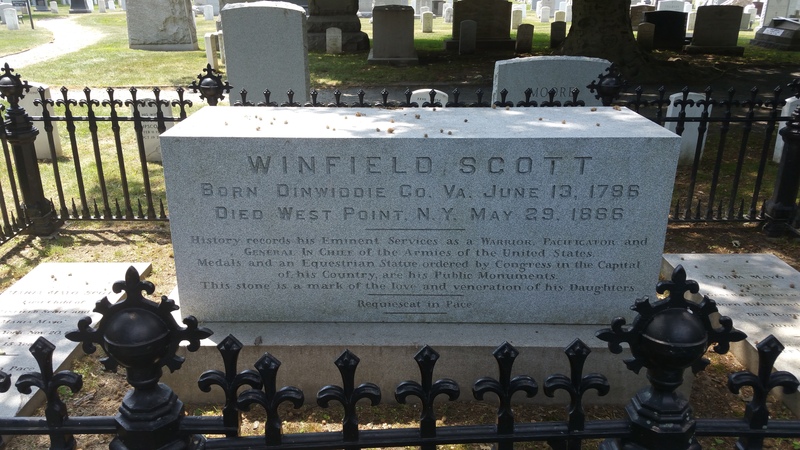 Gen. Winfield Scott (1786-1866). Although not a USMA graduate, Scott was one of our greatest military commanders and a strong supporter of the Academy. Cadets wear gray uniforms to honor Scott’s troops from the Battle of the Chippewa in the War of 1812. Gen. George Armstrong Custer, Class of 1861, cavalry hero of the Civil War. Died in the Battle of the Little Bighorn, 1876. Brian and I had seen the spot where he fell during our visit there in 2011. After our tour of the cemetery we came back to the main part of the campus. 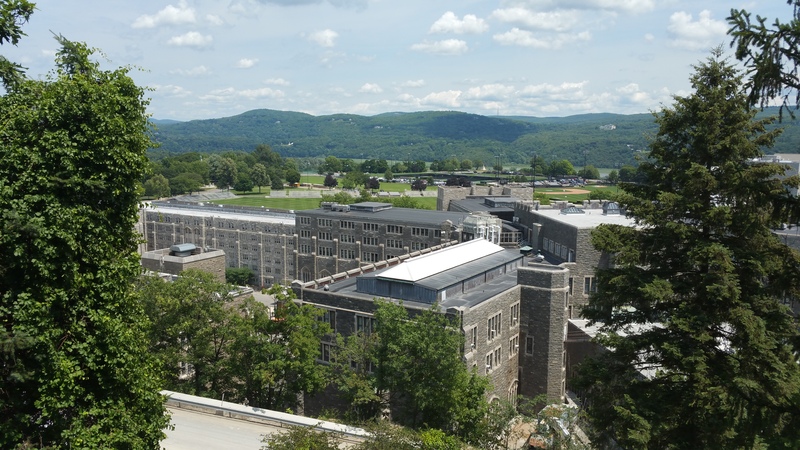 There are restrictions on visitors to West Point; at our alma mater and virtually every other college campus in America, anybody can wander around pretty much anywhere they want. Not here. But what we were able to see was great, like this view to the south, looking over Washington Hall, which houses the Cadet Mess Hall, toward the Plain, Doubleday Field and Trophy Point. Our last stop on the post was the famed Cadet Chapel. Dedicated in 1910, it took the place of the first chapel, which was completely disassembled and reconstructed on its present site near the cemetery. It is the place where Protestant services are conducted, and there are smaller chapels for Catholic and Jewish services. I’ve seen some of the great cathedrals of Europe, and this chapel is right up there with them. Constructed of native granite in the Gothic style, the Cadet Chapel combines size and intimacy. 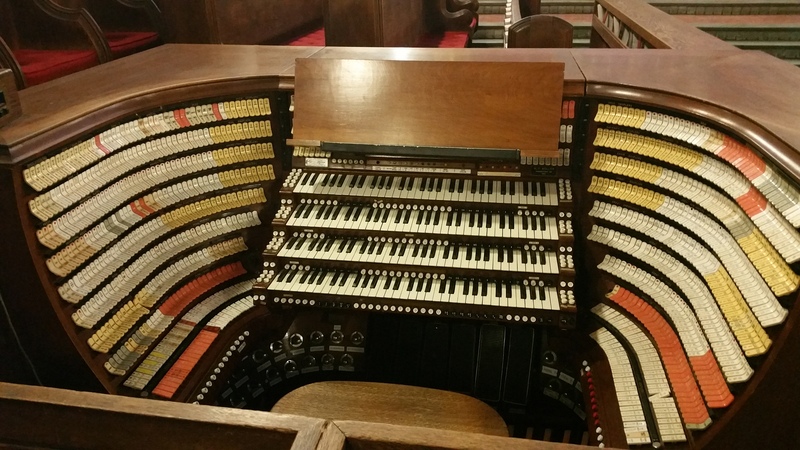 The chapel’s pipe organ dates back to 1911 and is the largest in the world, with 874 speaking stops controlling 23,236 pipes. 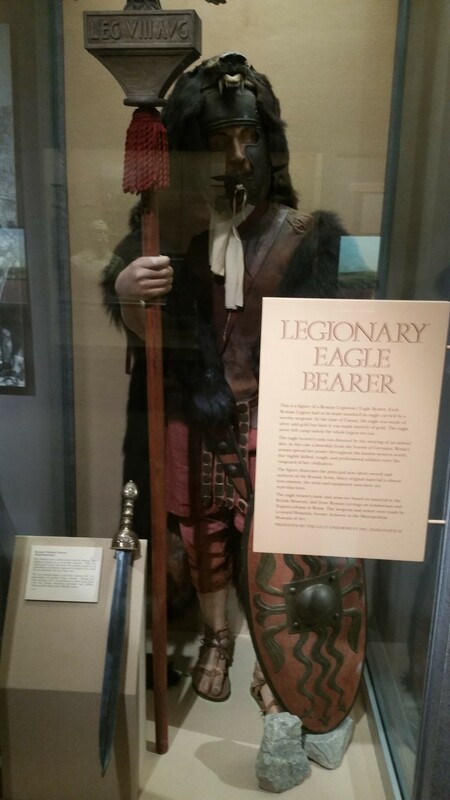 The museum traced the history of warfare dating from ancient times, including the Romans, who knew a thing or two about the subject. 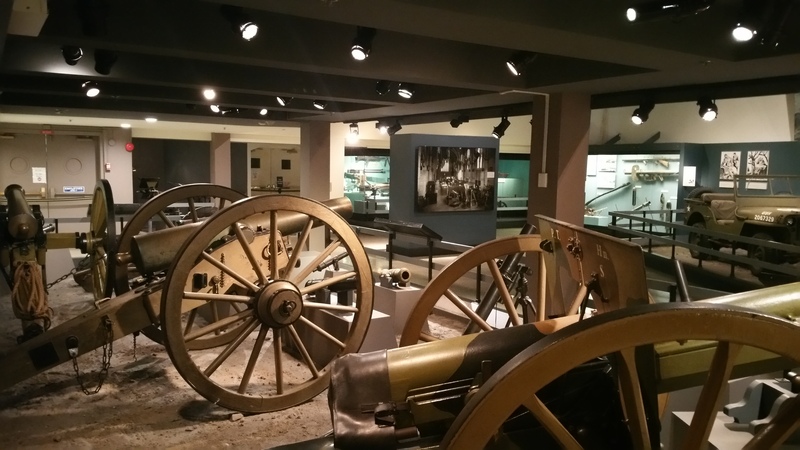 French field guns from World War I. 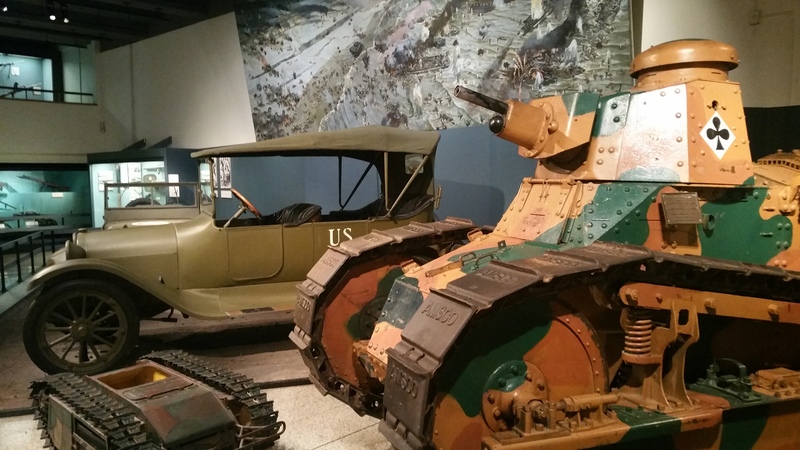 At right, a 1917 model tank, based on the French Renault. Crew of two, a 32hp engine, a 37mm cannon, top speed of 6mph. A century later the Army’s M1A1 Abrams tank has a crew of four, 1500hp, 120mm cannon, top speed about 60mph. After the museum, we returned to the Thayer and had a drink in General Patton’s Tavern and a fine meal in MacArthur’s Riverview Restaurant. The night was still young, so we hopped in the car and headed north a few miles to the town of New Windsor, where the local cinema was featuring Ant-Man. We returned to the Thayer after the show, and a deejay was playing some tunes up on the Zulu Time Rooftop Bar, so I stopped up to check out the scene while Alan hit the hay. It had been yet another fine day, and another one was coming up tomorrow, when we would head back down the Hudson to Long Island and the home of another president. 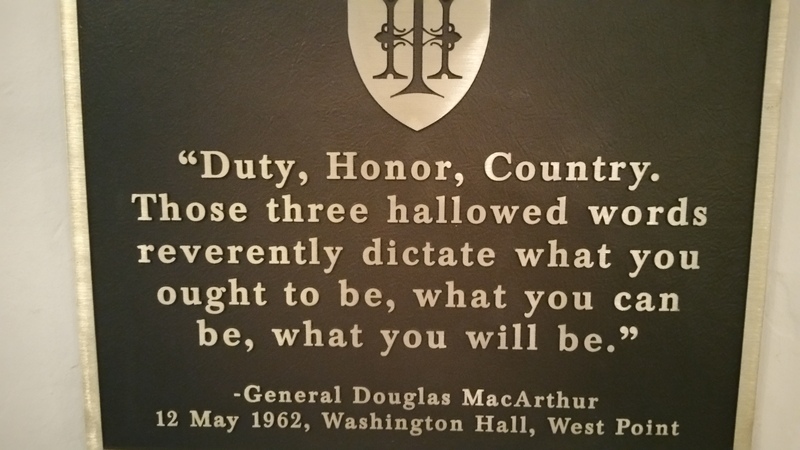 But we would remember our visit to West Point for a long time to come. Its motto is “Duty, Honor, Country,” and that’s a motto that works outside the post, too. We set out from West Point on a day that promised some of the hot, muggy weather we’d been told to anticipate. A drive of just under two hours awaited us. We had crossed the Hudson again the previous day, so this time we stayed on the west side of the river, heading south into New Jersey and then back onto the GW at Fort Lee. Our route took us westward through upper Manhattan and into the Bronx, although not within sight of Yankee Stadium, and then south through Queens into Nassau County. Everybody’s heard of Long Island, but what most non-New Yorkers don’t know is that two of the city’s boroughs, Queens and Brooklyn, are actually part of the island, at its western end. In fact, the only one of the city’s five boroughs that is on the mainland is the Bronx. Once we were into Nassau County, the landscape changed dramatically, becoming much less urban. The county has a population of 1.3 million and is one of the most affluent counties in the country. Further to the east is Suffolk County, comprising the eastern half of the island, with a slightly larger population but more than four times the land area, thus making it much less densely populated. Our destination today was Oyster Bay. Within the large township of the same name, the hamlet of Oyster Bay was quaint and interesting. Known as a “hamlet” because it is unincorporated, unlike a village, Oyster Bay is only 1.6 miles square and home to just under 7,000 people. We would not be staying the night here, but we ventured downtown and found a nice place for lunch, Taby’s Burger House. From there we headed back outside the hamlet to Youngs Memorial Cemetery. 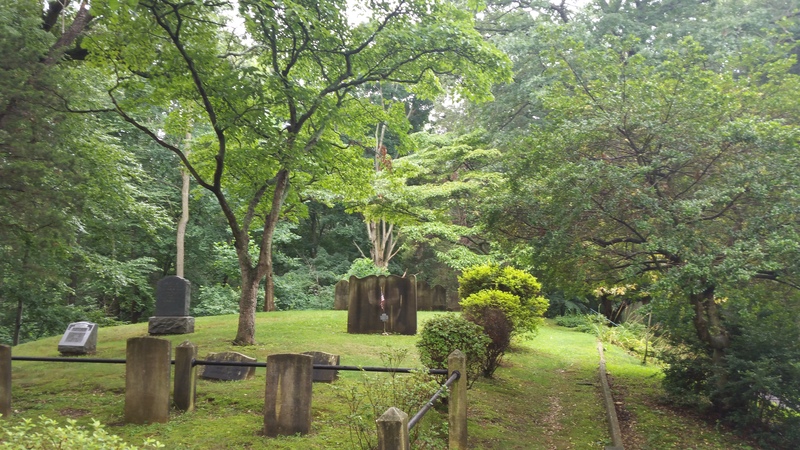 Used as a burial ground for over 350 years, the cemetery is named after Thomas Youngs, one of the early settlers. 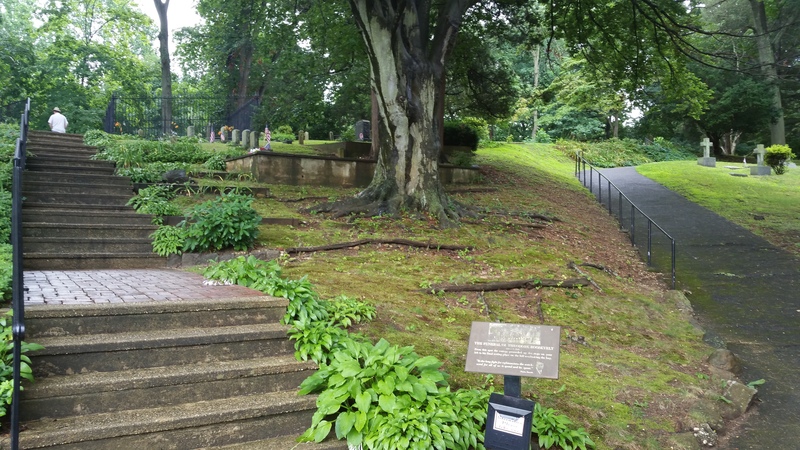 The cemetery is located on a hill near the site of his home, and although Youngs himself is buried here, its most famous resident, by far, is Theodore Roosevelt. 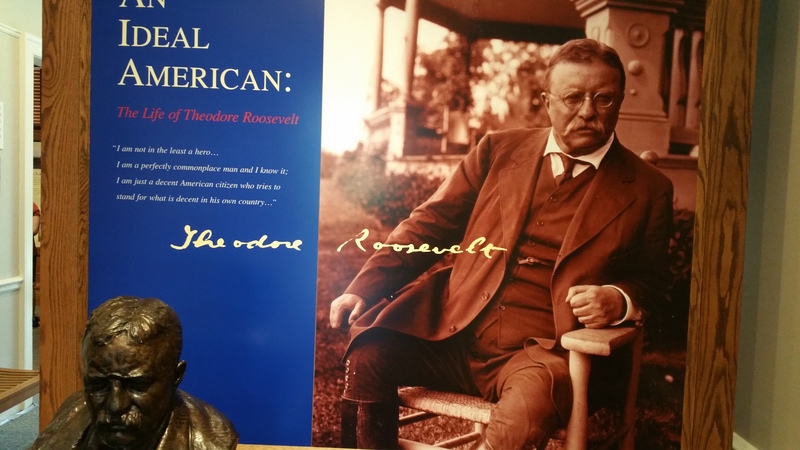 Our 26th president, TR certainly deserves his place on Mount Rushmore. 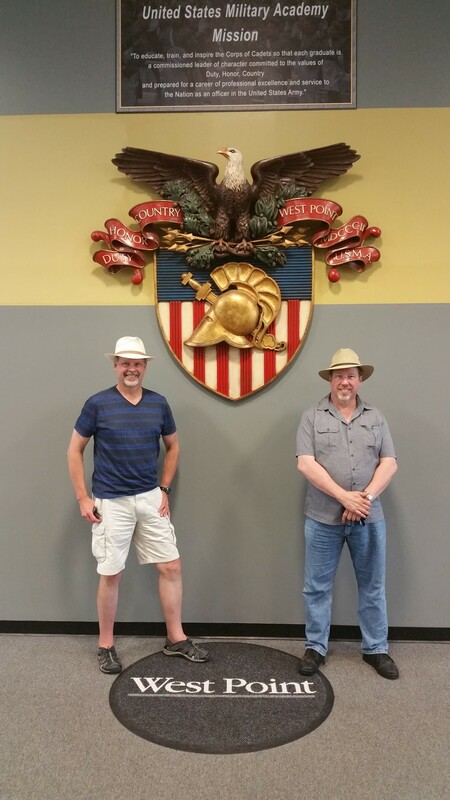 My brothers and I are all history buffs, and in Brian’s case he has taken it to the next level, as a teacher of U.S. history in a Phoenix high school. Alan and I are amateurs by comparison, but for all of us one of our favorite subjects is Theodore Roosevelt. Born in 1858 on Manhattan, TR was a New York state legislator, rancher and cowboy in the Dakota Territory, historian, author, naturalist, big-game hunter, federal Civil Service Commissioner, police commissioner of New York City, assistant secretary of the Navy, an Army officer who would lead troops in combat, Governor of New York, Vice President, and finally President of the United States, all before his 43rd birthday. Entire forests have been felled to print books about Roosevelt; I have a big library of them myself. Suffice it to say that as presidents go, he was one of the greatest in our history, and one I dare say we could certainly use right now. Theodore Roosevelt succeeded to the presidency in September 1901 upon the assassination of William McKinley. Elected to a term of his own in a landslide in 1904, TR left office in March 1909 after having refused to run for a second full term. He changed his mind and ran again in 1912, was denied the Republican Party’s nomination in favor of the incumbent, William Taft, and ran anyway at the head of the Progressive Party. He finished second to the Democrat, Woodrow Wilson, with Taft a distant third. TR had won almost all the GOP primaries but in those days the nomination was still determined in the proverbial smoke-filled rooms; as it was, in the election Taft siphoned off enough votes to hand the election to Wilson. Roosevelt survived an assassination attempt during the campaign; in October, he took a bullet to the chest in Milwaukee, but delivered his speech anyway before going to the hospital. Unfortunately, that wound, combined with the effects of a dangerous and debilitating 1914 trip to South America to explore a tributary of the Amazon, had a serious impact on his health. 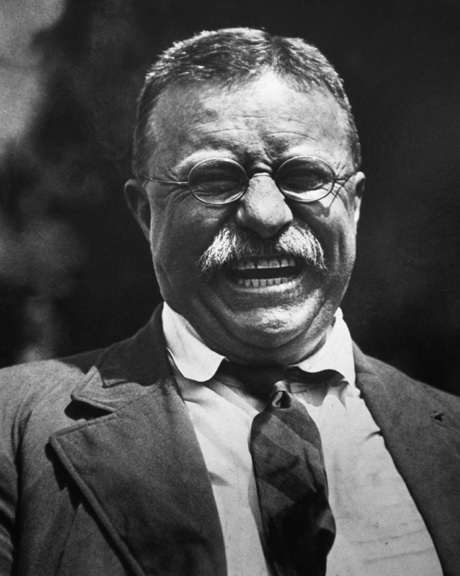 TR died in January 1919, less than three months after his 60th birthday. The path leading up the hill toward TR’s grave. Paying respects to one of our greatest presidents. 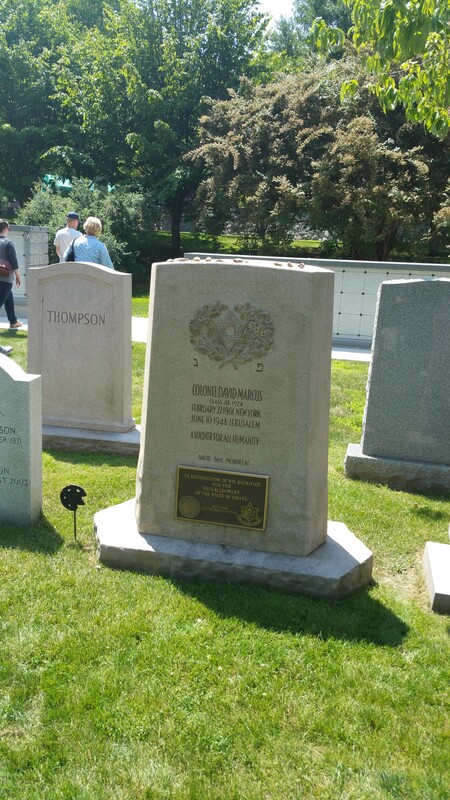 TR lies here with his beloved second wife, Edith Carow (1861-1948). 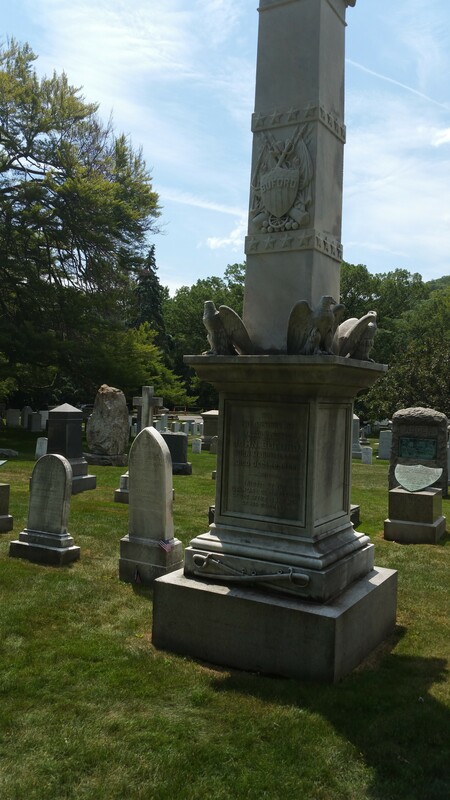 Youngs Cemetery is a hilly, peaceful place. 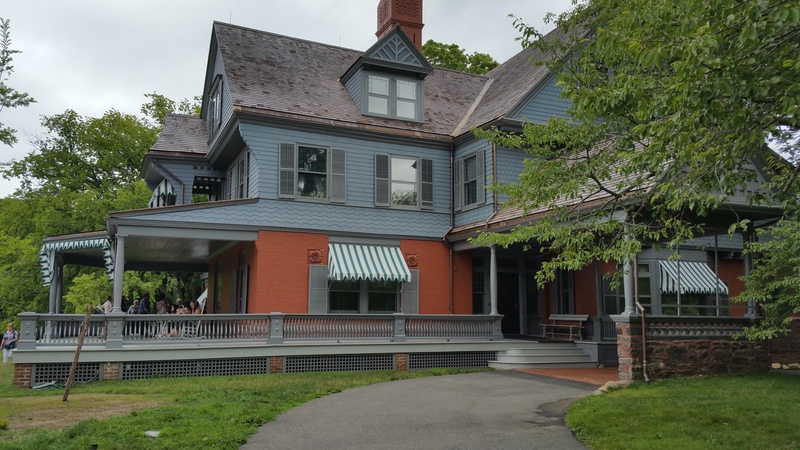 From the cemetery it was only a few miles to Sagamore Hill. We had booked an afternoon tour, and our timing was fortunate. Just a week earlier, the site had reopened to the public after a long period of renovation and refurbishing. Our original plans had called for us to fly in on July 6, but it’s a good thing we delayed it a week. In the latter half of the 19th century, a section of Long Island’s northern shore became known as the “Gold Coast,” with wealthy New Yorkers purchasing land here and building large estates. Theodore Roosevelt’s family was, by the standards of the times, very well off, although not nearly in the same league as the Vanderbilts or Rockefellers. 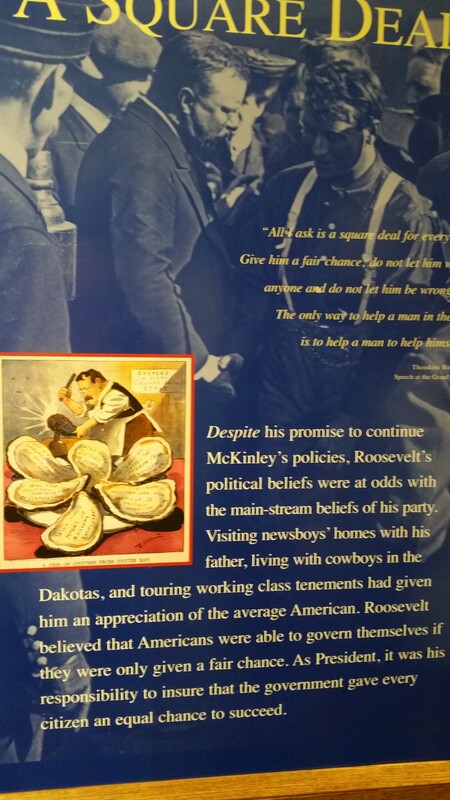 After his father died in 1878, TR inherited enough money to support him throughout his political career and his colorful but financially unsuccessful venture as a Dakota rancher. After his first marriage, to Alice Lee of Boston in 1880, TR began to build the estate he first wanted to call Leeholm. 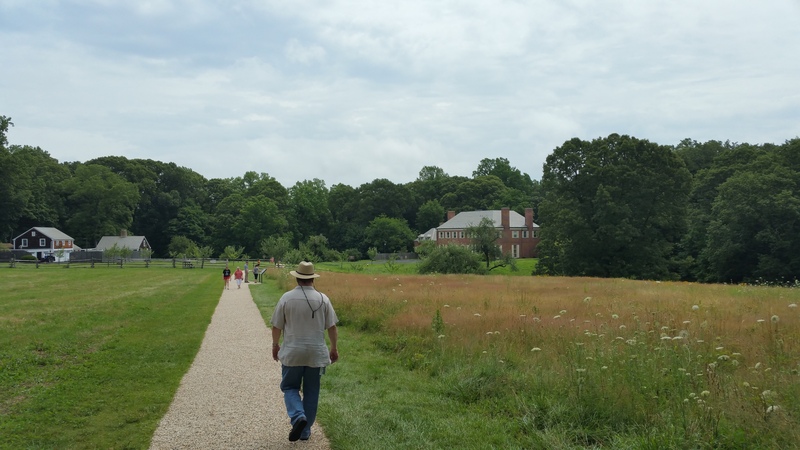 He purchased the land, 155 acres worth, for the equivalent of $700,000 in today’s money. 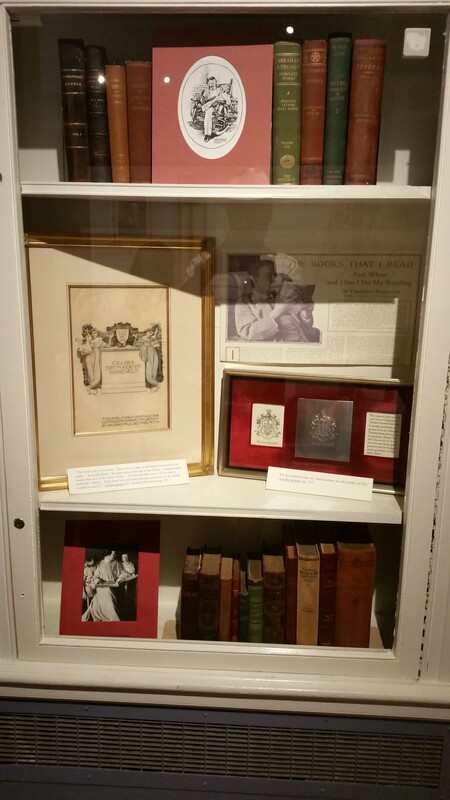 Alice died in 1884 and TR married childhood friend Edith Carow two years later. By the time they moved into the home in 1887, he had renamed the estate with the title it holds to this day. The original home had 22 rooms, and in 1905 TR added one more, the 1,200-square-foot North Room, for a price equivalent to more than $500,000. 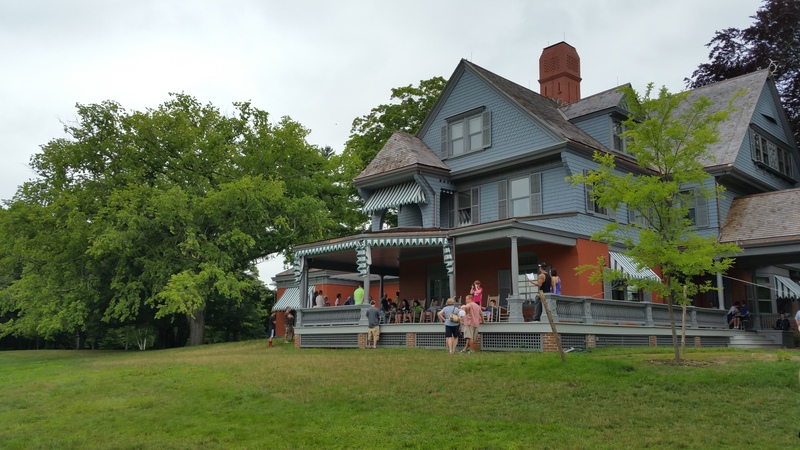 We arrived early, allowing us to hike over to the neighboring estate and visit the TR Museum, which is in the house that was built by his son, Theodore Roosevelt Jr. (1887-1944). Known as Ted, he was a man who was almost as much a dynamic figure as his father. Decorated for heroism in combat in both world wars, Ted Roosevelt died shortly after leading American troops ashore on D-Day, the only general officer to go in with the first wave. 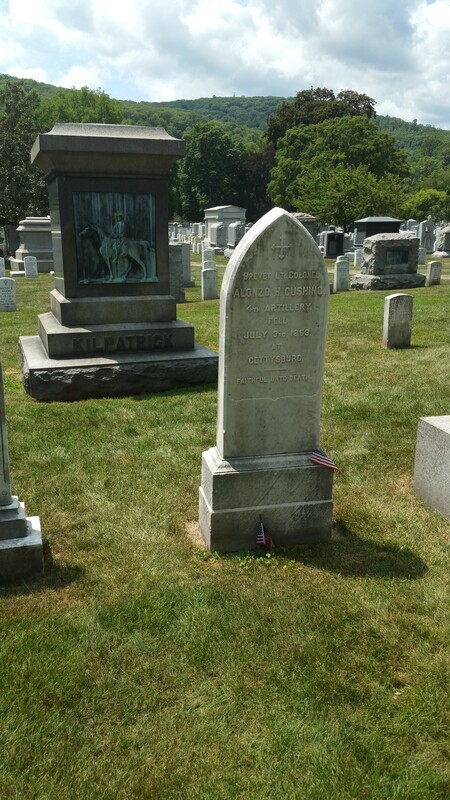 He and his father are one of only two father-and-son duos to be awarded the Congressional Medal of Honor for gallantry in battle; Arthur MacArthur and his son Douglas are the other. Alan leads the way down the path to the museum. 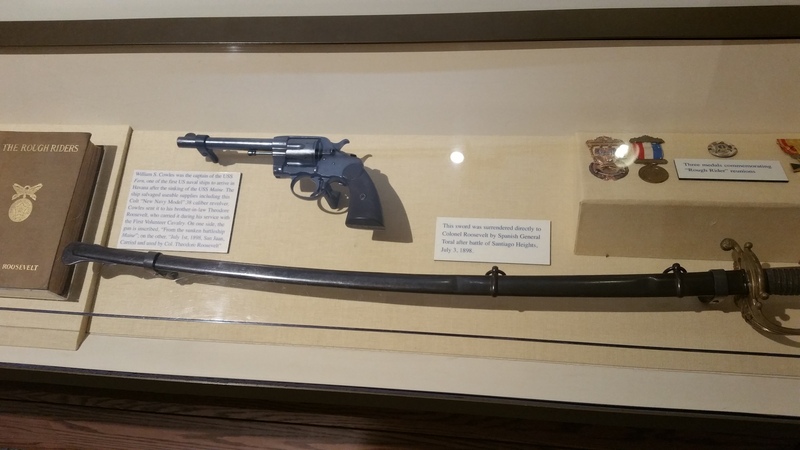 For TR aficionados, the museum is a treasure trove. 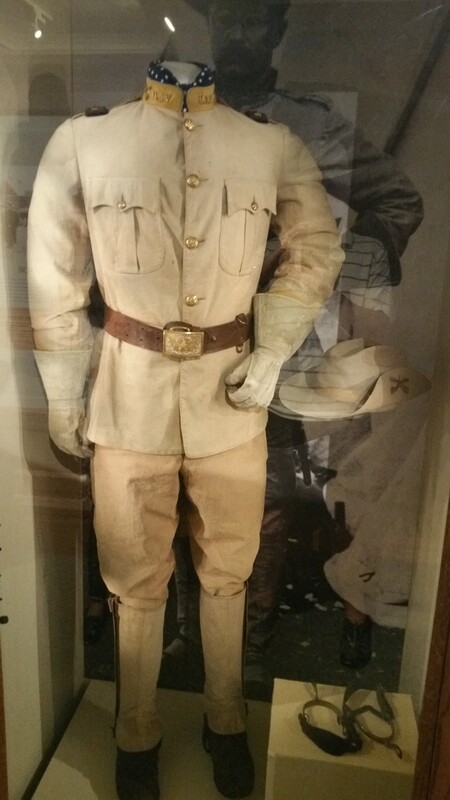 TR’s tailor-made Rough Riders uniform, which he did not wear in combat in Cuba during the Spanish-American War, 1898. The Colt .38cal revolver used by TR in Cuba. It was salvaged from USS Maine after its sinking in Havana Harbor early in February 1898. The sword was surrendered directly to TR by Spanish Gen. Toral after the battle of Santiago Heights, 3 July 1898. 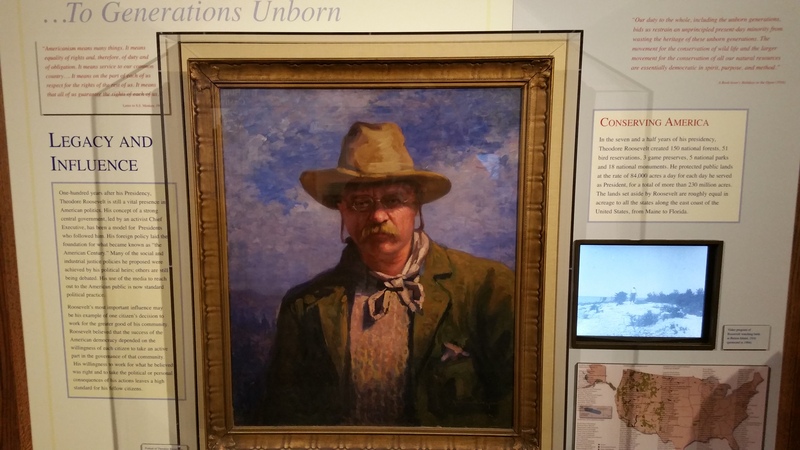 TR’s devotion to conservation of natural resources was legendary. During his presidency he created 150 national forests, 51 bird reservations, 3 game preserves, 5 national parks and 18 national monuments, a total of more than 230 million acres. 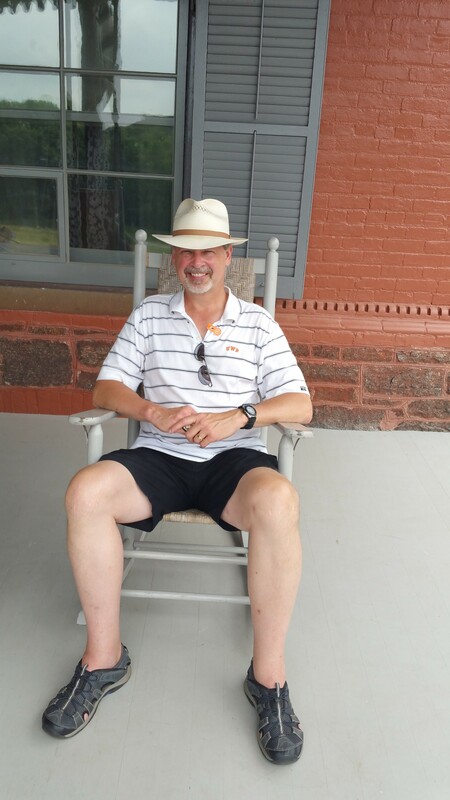 Fulfilling one of my bucket list items: taking a break on Theodore Roosevelt’s front porch! It had been another huge day, but the heat and humidity were starting to take their toll. We hopped in the car and headed back to the city. Our hotel for the next two nights was waiting for us. I took the wheel of our trusty rental and we made it back to Manhattan without incident, turned in the car a couple blocks from the hotel and trundled our luggage to our destination. 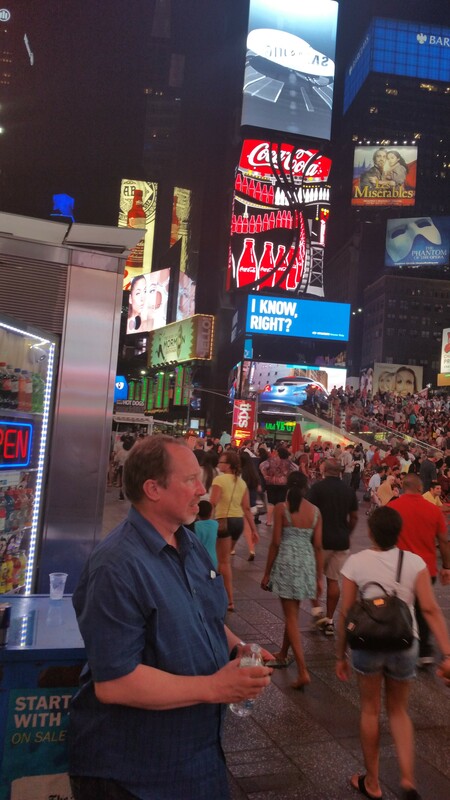 Check it out here: W New York Times Square. After resting for a bit, we changed clothes and found a nice restaurant for dinner, just a few doors down from our evening destination. 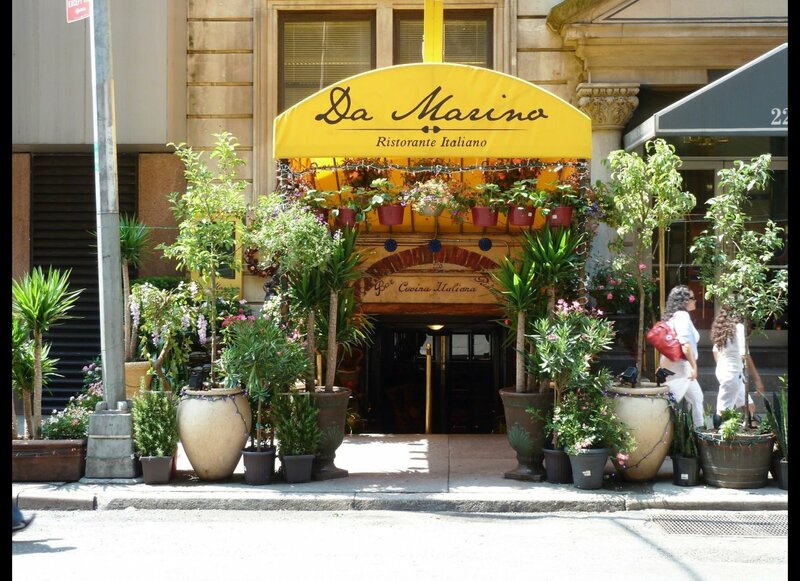 Da Marino, at 220 W. 49th St., has been a favorite hangout of the Broadway crowd for many years, and although we didn’t recognize anybody, we had a fine meal anyway. Here’s a photo of the entrance from a Huffington Post article on the restaurant. After the meal we went virtually next door to the Eugene O’Neill Theater. 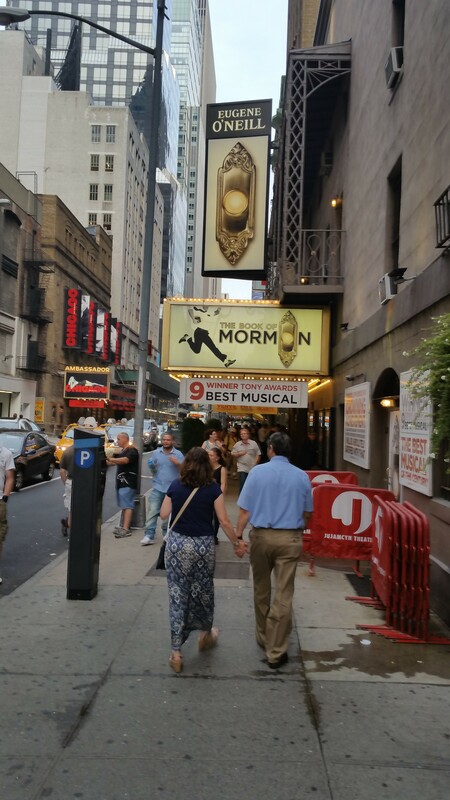 Alan has been very active in community theater for years out in Washington, so seeing a Broadway show was a must. 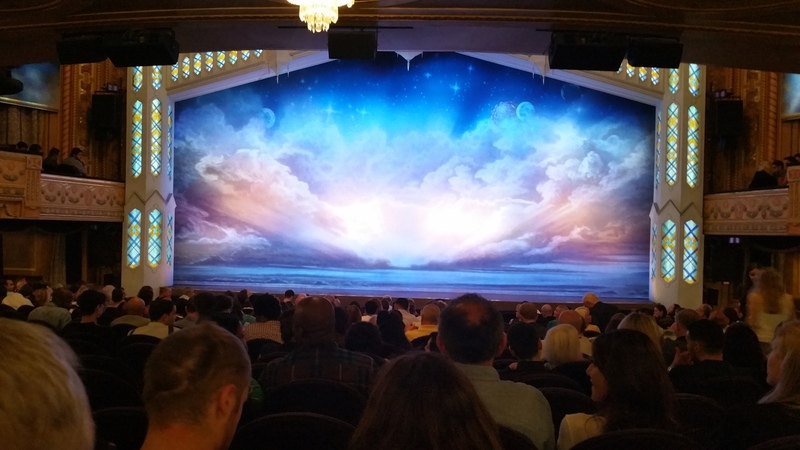 I let him pick the show and he chose The Book of Mormon. It would not have been my first choice–actually, with the Yankees playing at home that evening, a trip to the Bronx for the baseball game would’ve been my preference–but the show was a first-rate production. The night was still young after the show, and even though it had been a long day for us, it was Saturday night in Times Square, so we wandered around. We weren’t alone. We finally called it a night around midnight, having trekked all the way to the base of the Empire State Building. The next day would be our final full day in New York, and we would see our sixth and last museum of the trip and venture to near the top of the tallest building in the country. Despite the late night, we were up early Sunday morning and grabbed a cab for a wild ride to the south end of Manhattan. 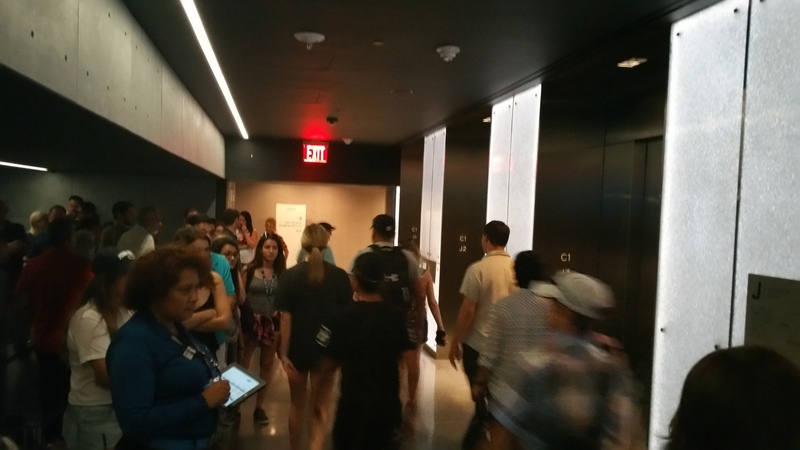 We had tickets to tour the 9/11 Memorial Museum and then ride up to the observation deck of One World Trade Center, known as the Freedom Tower. My first visit to New York was in the summer of 2002, less than a year after the terrorist attacks that brought down the twin towers. By the time of my visit the debris had been cleared away, leaving two enormous holes in the ground. 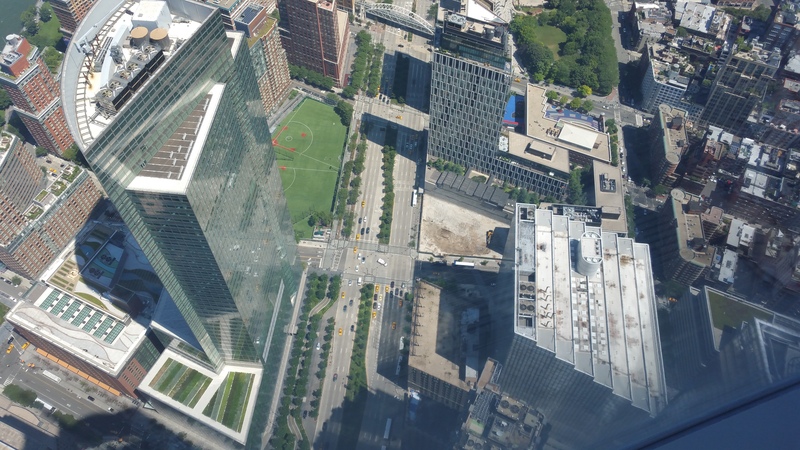 The original WTC site covered 16 acres and consisted of seven buildings, the two most prominent being the towers. 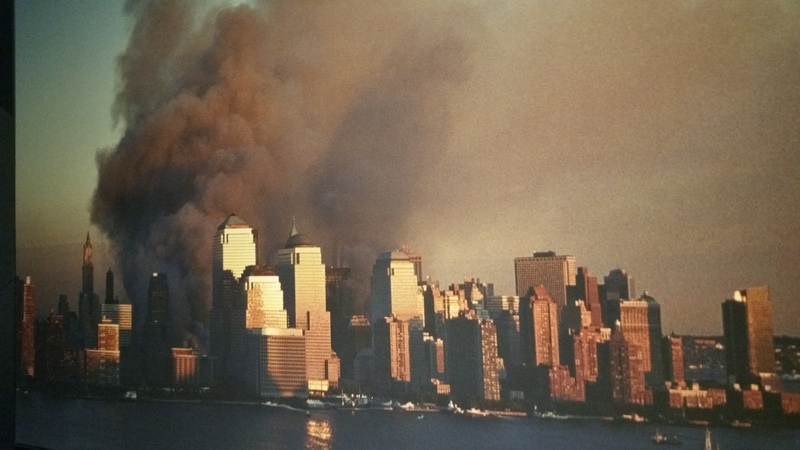 All were completely destroyed or heavily damaged on 9/11/01. The current site will have six buildings upon completion, plus the memorial. 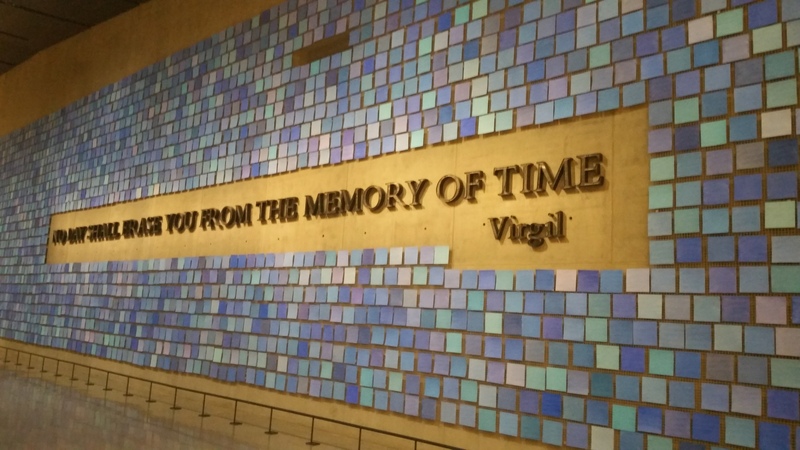 Of all the museums we visited on this trip, the 9/11 Memorial Museum was the most vivid and carried, by far, the biggest emotional impact. If you can go through this place without shedding a tear, well, you’d be in a distinct minority. Its exhibits include 23,000 images, over 10,000 artifacts, nearly 2,000 hours of oral histories of the victims, and over 500 hours of video. 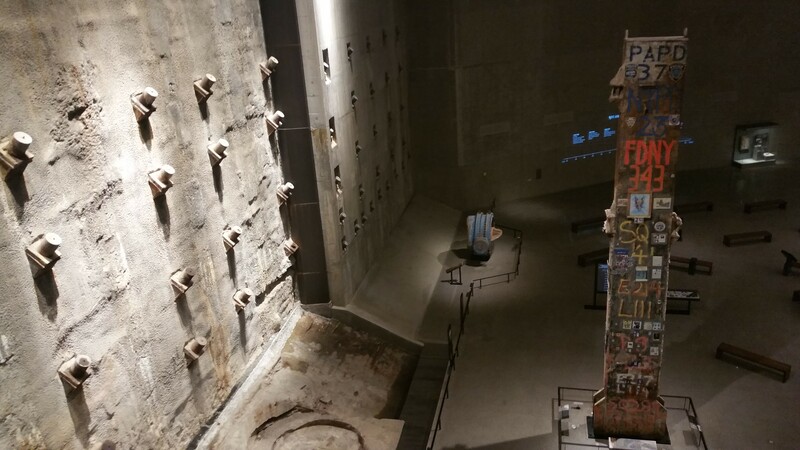 Much of the museum is underground, where one can see the foundations of the original towers. 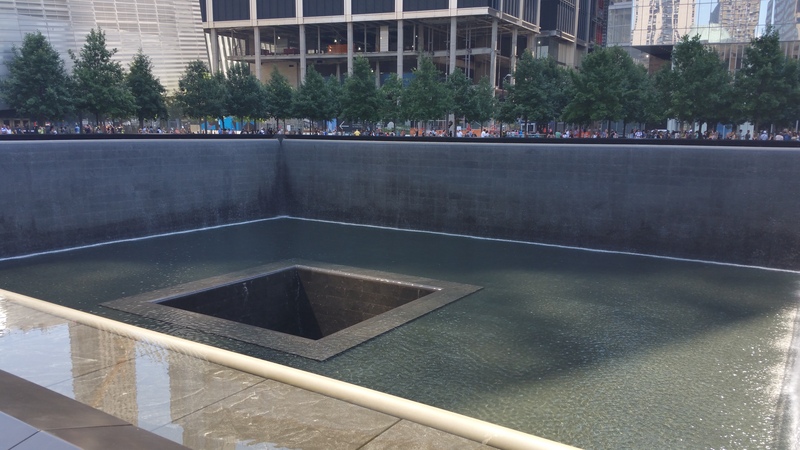 The vivid imagery, in still photos and video, reminds us all of that day when so many died. This sculpture consists of 2,983 individual watercolor drawings, representing each of the victims from the 9/11/01 and 2/26/93 attacks. Each is a different shade of blue, as artist Spencer Finch struggles to depict the sky on those days. The quote is from “The Aeneid,” by the Roman poet Virgil. Each of the letters were forged from original WTC steel by the artist Tom Joyce. 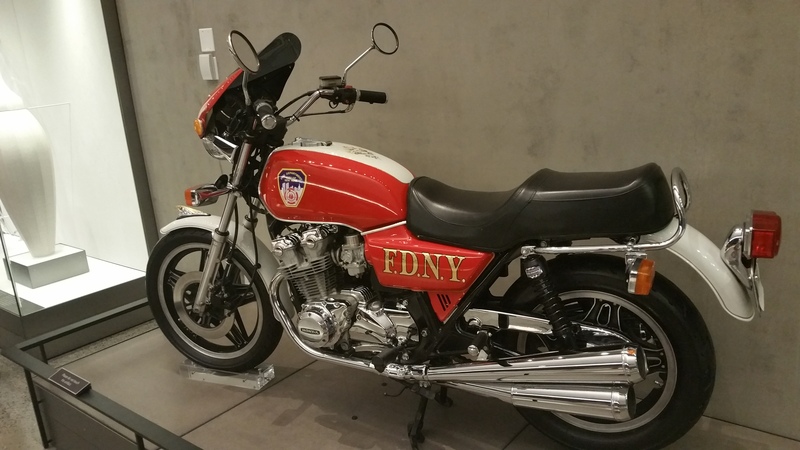 This 1979 Honda motorcycle was purchased by fireman Gerard Baptiste, who perished on 9/11 as he fought to rescue others. The surviving members of Baptiste’s ladder company completed the bike’s restoration in his memory. Known now as the “Dream Bike,” it has 10 roses painted on the gas tank cover to commemorate the members of Ladder Co 9 and Engine Co 33 who died that day. For me, perhaps the most moving exhibit in the museum was this memorial hall. Photos were not allowed inside. 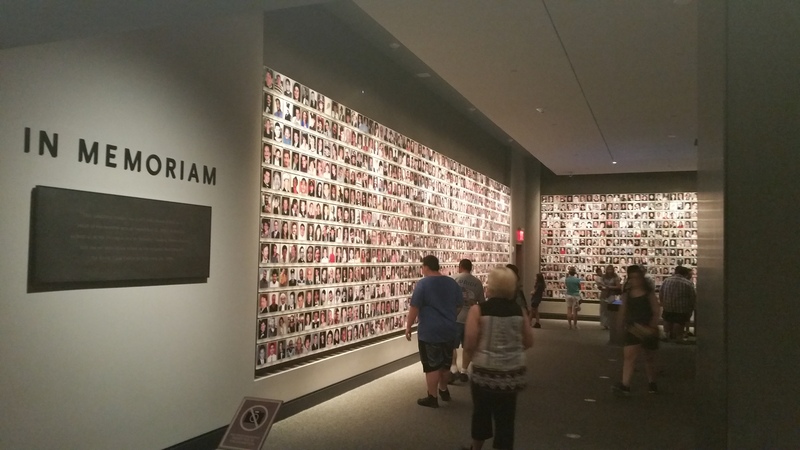 There are pictures of each victim, and you can go to a computer screen to access each one. The individual displays show photos and video from the victim’s life, with audio stories from family members and friends. Although I did not know any of the victims personally, I had read the story of one of them, and on this visit I accessed his memorial. Cyril Richard “Rick” Rescorla was born in England in 1939, joined the British Army at eighteen and served three years. After leaving the Army he served in the Northern Rhodesia Police, where he met and befriended an American soldier who urged him to emigrate to the U.S. and join our Army, which Rescorla did in 1963. In Vietnam he was decorated several times for heroism in combat and participated in the 1965 Battle of Ia Drang. The battle was vividly commemorated in the 2002 film We Were Soldiers, in which Mel Gibson played Rescorla’s commanding officer, Lt. Col. Hal Moore. After the military, Rescorla earned a law degree and eventually got into corporate security with Dean Witter Reynolds at the WTC in 1985. He was concerned about the building’s security and in his analysis he predicted the bombing that would occur in 1993. Dean Witter merged with Morgan Stanley in 1997 and occupied 22 floors in the south tower. The firm rejected Rescorla’s recommendation to move to a more secure building in New Jersey, opting to maintain the prestige of being a WTC resident. Undaunted, Rescorla regularly drilled the employees in evacuation procedures, which most considered to be an annoying waste of time. But on 9/11, Rescorla knew exactly what to do. He ignored a Port Authority advisory that people could remain at their desks and began to hustle them out to safety, maintaining discipline and morale by singing old songs from his boyhood in Cornwall. He called his wife and told her what was happening, saying, “If something should happen to me, I want you to know I’ve never been happier. You made my life.” Rescorla succeeded in evacuating almost all of Morgan Stanley’s 2,687 employees. When told he had to leave, Rescorla said, “As soon as I make sure everyone else is out.” He was last seen on the 10th floor, heading upward, when the tower collapsed. I became aware of Rescorla by reading his biography, Heart of a Soldier, published in 2002. Eleven years earlier, his old Vietnam commander, Hal Moore, had published his own autobiography, We Were Soldiers Once…and Young, upon which the Gibson movie was based. Rescorla is the soldier depicted on the cover. He’d told his wife that he was uncomfortable being called a hero; the real heroes are the ones who didn’t come home, he said. There are a lot of people alive today who would say that Rick Rescorla was indeed a real hero. The cornerstone of 1 WTC was laid on July 4, 2004, although construction didn’t actually start for nearly two years. The building was completed in July 2013 at a cost of nearly $4 billion. 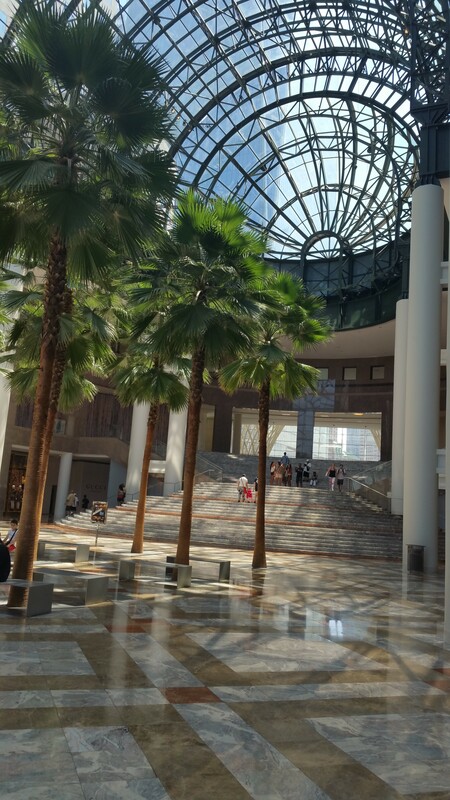 Its first tenant was magazine publisher Conde’ Nast, which now occupies over a million square feet of floors 20-44. Its 25-year lease is valued at $2 billion. About 40 percent of the building remains vacant. Visitors to the building have a different entrance than tenants, and a separate elevator, and it is quite an elevator. 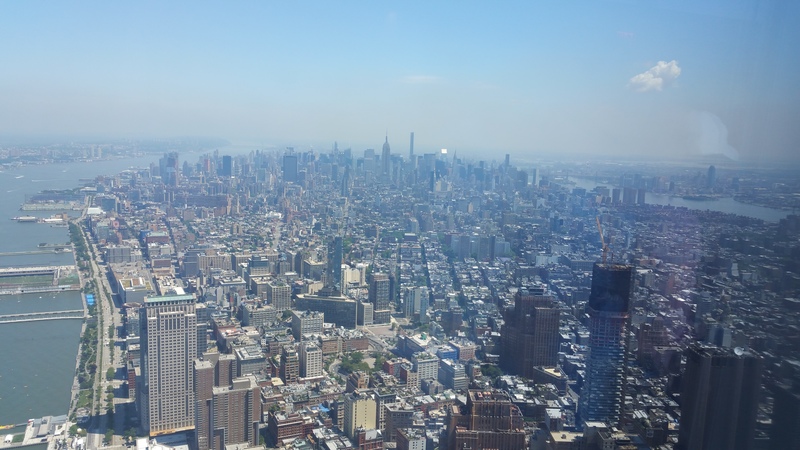 You can get a feel for it, and the observatory’s many exciting features, by visiting its website: One World Observatory. Here’s a video I shot from inside the elevator on the way up: Observatory elevator ride. I wouldn’t say I’m afraid of heights, but I would say I’m not terribly fond of them. I’d been to the open-air observation deck at the Empire State Building and managed to tolerate that. This experience, inside the all-enclosed Observatory, was different. Although you can go right to the glass and see an incredible vista, in some respects it doesn’t feel like you’re really there. But when you look down, it’s a long, long way to the ground. The view to the southeast, toward the Statue of Liberty. Looking north toward midtown, with the Empire State Building in the center at the far edge. When you look down, it’s a long way down indeed. We exited through one of the beautiful atriums. Outside, the foundations of the two original towers have now been converted to memorials as reflecting pools, each nearly an acre in size and featuring the largest man-made waterfalls in North America. Names of the victims from the ’93 and ’01 attacks are inscribed on bronze plaques edging the pools. 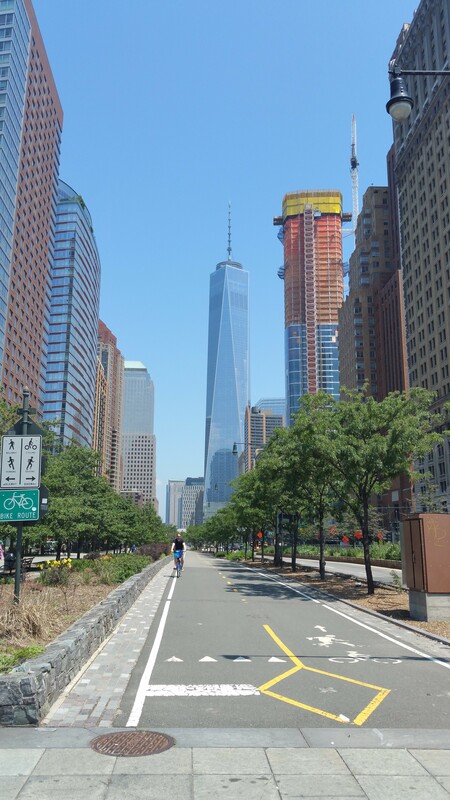 We headed back toward midtown on foot, but 1 WTC never seemed to be too far behind us. It was nearly noon and the day was heating up. Our intention was to wander around lower Manhattan and take in more of the sights, eventually making our way to Greenwich Village. 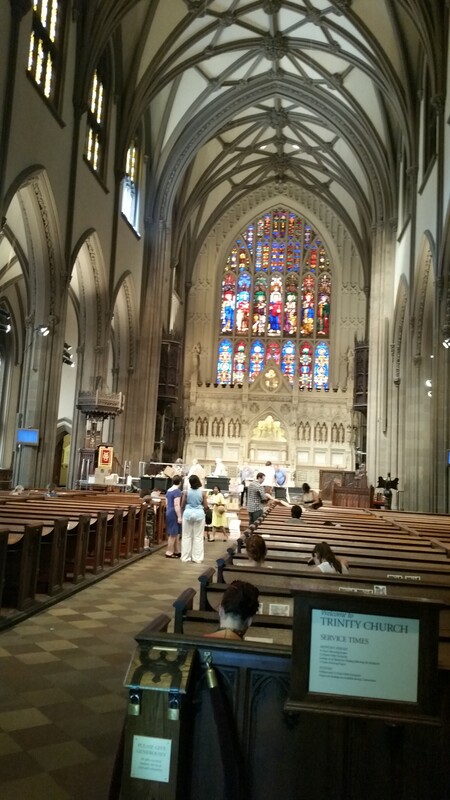 We found Trinity Church, near the intersection of Wall Street and Broadway. The morning’s services had just concluded, and we were able to get inside and look around. The history of the church goes back to the late 17th century, when members of the Church of England purchased the acreage as part of a land grant. The original rent was 60 bushels of wheat per year. The notorious Scottish pirate William Kidd lent the runner and tackle from his ship for the hoisting of stones during construction of the original building, which was destroyed in a huge fire in 1776 that claimed nearly a quarter of the city. The current church is actually the third building, and was completed in 1846. Its 281-foot spire and cross made it the tallest building in the city until surpassed by the New York World Building in 1890. 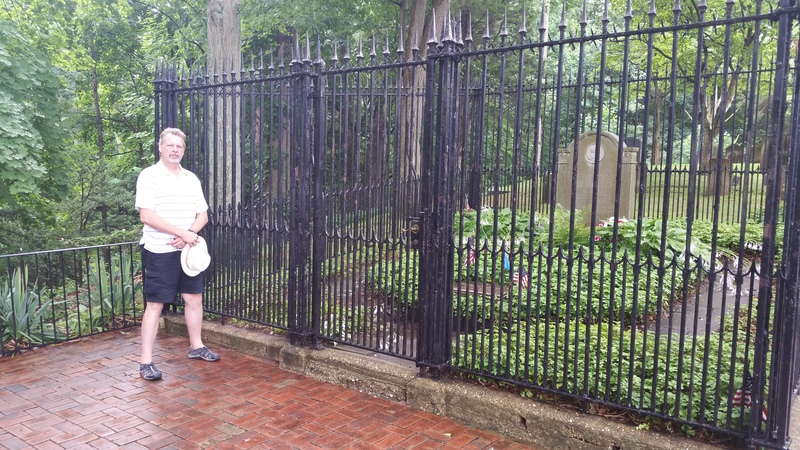 There is, of course, a cemetery, which we explored. It’s a small one but its tenants include one of the Founding Fathers, Alexander Hamilton, the first Secretary of the Treasury; Franklin Wharton, the third Commandant of the Marine Corps; Navy Captain James Lawrence, who was killed in action while in command of USS Chesapeake in a battle with HMS Shannon during the War of 1812, and whose last words (“Don’t give up the ship!”) live on in naval lore; the fourth Secretary of the Treasury, Albert Gallatin, who holds the record for longest tenure in that office (just shy of 13 years); and the inventor of the steamboat, Robert Fulton. The heat and humidity were starting to get to us, so we cabbed it back to the hotel for a siesta. After a few hours, we were refreshed and headed back down to the southern end of the island. There was one more watering hole Alan wanted to see: McSorley’s Old Ale House at 15 E. 7th St. Established in 1854, it serves only beer, and only two kinds, light and dark. Abe Lincoln once drank here, and so did Ulysses Grant and Theodore Roosevelt, among many other New York residents and visitors. 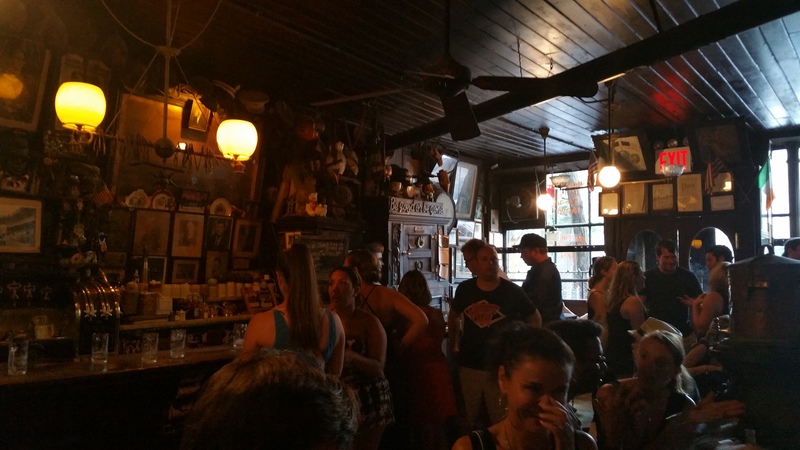 The walls of McSorley’s are crammed with memorabilia, none of which have been removed in over a century. Houdini’s handcuffs are connected to the bar rail. Women were not allowed in until 1970. We made our way to Greenwich Village. One of the city’s most famous neighborhoods, it’s also one of the most expensive: real estate prices here are typically north of $2,000 per square foot. Indeed, we saw this unique place at 75 1/2 Bedford St. that is the narrowest house in the city and sold for $3.25 million a couple years ago. 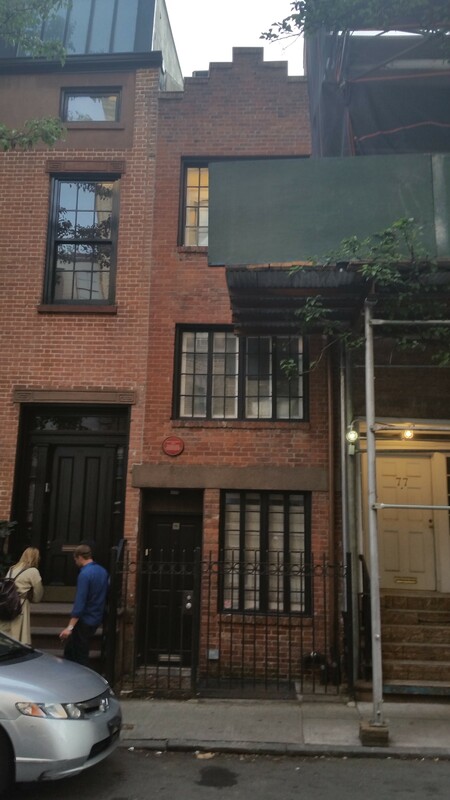 Formerly the home of the actor Cary Grant and poet Edna St. Vincent Millay, among others, it is 8’4″ wide at the base. Even with three stories, this place might be a bit cramped. We wound up at Washington Square Park, where yours truly got involved in a “street art” demonstration by twin brothers Kareem and Tyheem Barnes, better known as Tic and Tac. But that was about it for us, so it was back to the W for our final night in the city. We had an early call for the next morning. It had been quite a day, the last in a string of them. Monday, July 20 — to LaGuardia and home. They say that New York is the city that never sleeps. 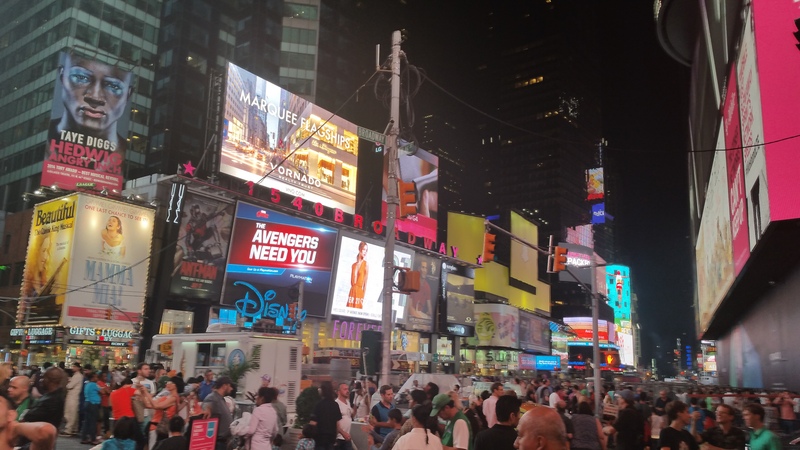 Certainly it had seemed that way around midnight Saturday night, when thousands of people crowded Times Square. This morning we had to be outside by 4am to catch a cab to the airport, and there were still a few pedestrians on the sidewalks, finishing their rounds from the night. Alan’s long series of flights home departed first, and we parted at LaGuardia with a hug. I made my way to a different terminal for my direct flight to Minneapolis. 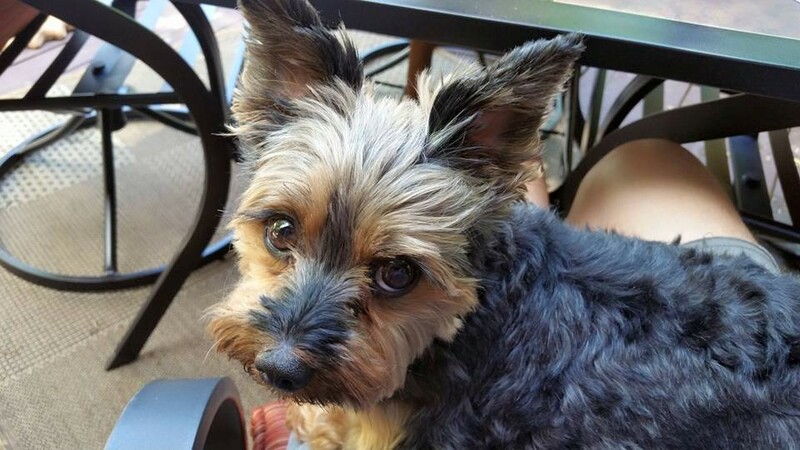 By early afternoon I was on the ground in Minnesota and in my car, heading east into Wisconsin, and by late afternoon I was on the deck, with our Yorkie, Sophie, on my lap. She was happy to see her dad, and he was sure happy to see her. It had truly been a fine trip, filled with great memories that will stay with me and Alan forever. But like my trip with Brian back in 2011, the best part of this adventure was exploring these places as brothers. Within a few years, all three of us will be new retirees. Then our childhood will seem long ago indeed, those happy days at our house in Potosi, down in the southwest corner of Wisconsin. Going fishing with our grandfathers on the Mississippi, playing ball with our dad, watching football games on our old black-and-white TV and cheering on our favorite players—Johnny Unitas for me, Bart Starr for Alan, Charley Johnson for Brian. By the latter years of this decade we each will have raised two fine children, earned a passel of college degrees, and concluded professional careers. These trips we have taken will be just one more thing that has bound us together. We may always live in different parts of the country, able to see each other only occasionally, but there will always be new places to explore, new things to learn, and we will be able to do some of that together. Time to start planning the next trip! Previous Post: Brothers in the Empire State, part 1.